The Pirelli Trophy West USA heads to Northern California and Thunderhill Raceway this weekend, with two races on the schedule in the fourth of eight rounds of Porsche competition in the 2018 season. After three successive events on comparatively flat, desert-based tracks (Las Vegas, Thermal and Utah), the series makes its way to the rolling hills of Willows, California, near the Mendocino National Forest. Thunderhill Raceway, home to the famous NASA 25 Hours of Thunderhill held in December, is one of the few club-owned racing facilities (the track is a wholly owned subsidiary of the Sports Car Club of America’s San Francisco Region). 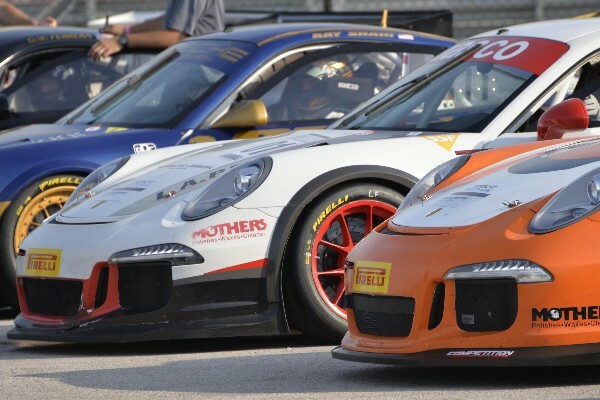 The field with over 30 Porsche GT3 and GT4 cup cars will enjoy separate events, with two races on Saturday and Sunday. Diamond and Diamond Masters (2017-2018 991.2 GT3 Cup), Platinum (2015-16 991.1 GT3 Cup) and Gold (2010-2013 997.2 GT3 Cup) will compete in their own set of races, with Silver (Cayman Clubsport GT4 MR) and Bronze (2016 Cayman Clubsport GT4 Trophy) classes contesting a separate pair of events. The series will utilize the classic three-mile, 15-turn course with the bypass around the very tight Turn 5 “Cyclone” turn. Series Director Steven Costello highlights what the drivers can expect from the upcoming weekend. Veterans Kevin Woods (TruSpeed Autosport) and Loren Beggs (911 Design) return to action with a mere one point separating the top two in the premier Diamond class. In Diamond Masters, Competition Motorsports’ Michael Zuieback has enjoyed a consistent season, taking five of the six victories to date. 21-year-old Sean McAlister has taken the Platinum class by storm in his first season in the Porsche GT3 Cup Car (after two years in the GT4 class), scoring a perfect six for six in the victory column. The Racers’ Group has fielded two drivers in the Silver Class, Chris Bellomo and Jim Rappaport, with Bellomo leading his teammate in victories 5-1. The fiercest competition this season has been in the Bronze class, with second year racer Laura Ely leading the standings over Carl Tofflemire and Steve Goldman. The Black Sheep Racing driver, who lives in the Bay Area, experienced her first ever track day at Thunderhill and looks forward to her first opportunity to race there. Competent Motorsport President Greg Franz is pleased with the level of competition so far in 2018, with each event seeing close, hard racing between all classes. With two races Saturday and Sunday, Pirelli Trophy West USA live timing and scoring can be followed throughout the weekend at http://www.competentmotorsport.com/index.php/live-timing/.